Why do I need to adjust the daily budget? The main point of retargeting campaign is to re-engage all your website visitors who didn't make the purchase. As your visitor base grows, your current daily budget may be not enough to cover all your potential customers, so you may need to invest more in the ads to get better returns and more sales. When do I need to adjust the budget? returns on your advertising spend need to be at least three times bigger than what you invested. 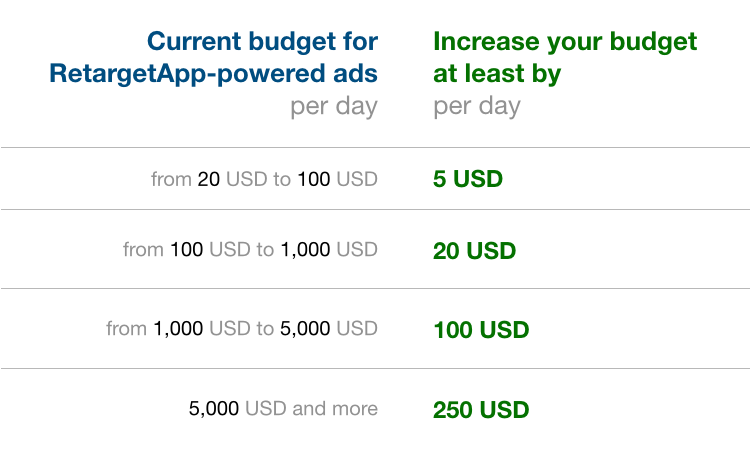 For example, if you set the daily budget of $30/day and you consistently spend $30 every day for a week and get at least $90 a day in sales brought by RetargetApp-powered ads, it will be a good idea to set the daily budget to $35/day. How big should my new budget be? Do I always get better results if I set a higher budget? Only if the increase decision was made based on the audience size and spending tendencies. The whole point of increasing the daily budget is reaching out to a bigger portion of your audience. However, if you spend 50% or less of your daily budget on a regular basis, increasing it will not improve the campaign stats. Note: when you assess the returns on your advertising spend, remember that they are relative, i.e. even though 300% return is lower than 1000%, 3x return with $100/day budget brings you more money than 10x return with $20/day budget.